The first edition of the Texas Almanac was issued by The Galveston News in January 1857, 21 years after Texas won its independence from Mexico and only 12 years after it became a state. The focus of the earliest editions of the Texas Almanac was on history and the workings of the state government. These 19th century editions included many first-person accounts of the Texas Revolution and the early days of the Republic and of statehood. An edition was published each year through 1873, except for 1866, totaling 16 annual editions. The editions for the years 1862–65 were of pamphlet size, ranging from 48 to 64 pages. Because Galveston was one of the Gulf Coast ports blockaded by the Union Navy and there was constant threat of armed conflict during the war, production of the 1862 edition was moved to Houston, and the next three editions were published in Austin. Post–Civil War publication was resumed in Galveston in 1867. With the 1869 edition, the name was changed to The Texas Almanac and Emigrant’s Guide to Texas, reflecting the state’s need to attract settlers. The 1873 edition was the last 19th century edition, as Willard Richardson died in 1875, and no one at the Galveston paper was interested in continuing the publication. In 1885, The Galveston News spun off The Dallas Morning News as a sort of North Texas branch newspaper. George Bannerman Dealey was sent from Galveston to Dallas to establish the Dallas paper. Dealey thought that the Almanac would be a way to encourage the economic development of the state. In 1904, The Dallas Morning News resumed publication of the Texas Almanac. Just three years earlier, the Spindletop Oil Field had been discovered near Beaumont, boosting Texas into the petroleum and industrial age. Following another hiatus, the Almanac resumed publication with editions in 1910, 1911, 1912 and 1914. Another gap in the series ensued with the outbreak of World War I. The present series was begun in 1925 by The Dallas Morning News, with annual editions through 1929, when the effects of the Great Depression caused a change to a biennial cycle. This schedule has been maintained, with only a couple of exceptions. Beginning with the 1941–42 edition, all Texas Almanacs have carried a two-year designation. Besides the Sesquicentennial Edition of 2006–07 marking the 150th anniversary of the Almanac, there have been four other special editions: the 100th anniversary of the Almanac (1956–57); the George Bannerman Dealey memorial edition (1958–59); the 110th anniversary of the first issuance of the Texas Almanac and the 125th anniversary of the founding of A.H. Belo Corporation (1966–67); and the Texas Sesquicentennial edition (1986–87), celebrating the 150th anniversary of the founding of the Republic of Texas. By 1950, the Texas Almanac had become a reference book on resources, industries, commerce, history, government, population, and other subjects relating to the political, civic, and economic development of Texas. Stuart Malcolm McGregor, who had edited the Texas Almanac since 1925, retired in 1961 after publication of the 1961–62 edition, which was dedicated to him by the publishers. The editorial policies and format that he established were continued in later editions. In 1961, Walter B. Moore became editor of the publication. Fred R. Pass succeeded him in June 1973. Upon Pass’s resignation in 1981, Michael T. Kingston became editor. Kingston served as editor until his death in 1994, at which time Mary G. Ramos was named editor. Ramos had worked for the Texas Almanac since 1985, when she was named assistant and then associate editor, replacing Ruth Harris, who had worked for The Dallas Morning News for 49 years. Ramos retired as editor in 2003 and replaced by Elizabeth Cruce Alvarez, who left in 2017. Today the Almanac is edited by Rosie Hatch and Robert Plocheck. 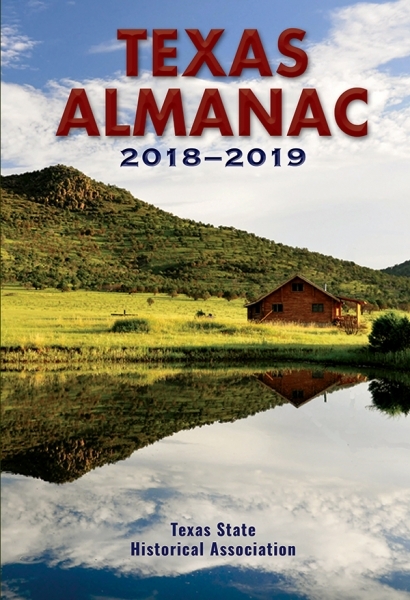 On May 5, 2008, the Dallas Morning News, Inc. donated the Texas Almanac to the Texas State Historical Association, since 1897 regarded as one of the nation’s most dynamic regional historical organizations. The gift included inventory, work-in-progress, its trademark, its URL, archives, and certain other assets. TSHA also publishes the Southwestern Historical Quarterly, which boasts more than 100 books in print, and the internationally known Handbook of Texas Online, which receives more than 4 million views per month. Its mission is to “foster the appreciation, understanding, and teaching of the rich and unique history of Texas and, by example and through programs and activities, encourage and promote research, preservation, and publication of historical material affecting the state of Texas.” Learn more about the TSHA here.